Can You Charge the iPhone Faster with AirPlane Mode? If you follow the general tech world through just about any medium, be it Twitter, Pinterest, or blogs, you may have seen a pretty bold battery charging claim gaining popularity lately, usually something along the lines of: “charge your iPhone twice as fast just by switching it into AirPlane Mode!” The theory behind that claim being that toggling AirPlane Mode on disables all communication radios and wireless transmitters in the device to make and receive calls, use cellular and wi-fi data, or have access to the GPS feature. It sounds great, maybe even reasonable since those things can drain the battery, plus switching airplane mode on is super easy, but does it actually work? You’ll find plenty of iPhone and Android users who absolutely swear by the fast charging AirPlane Mode trick, but our own tests were much less convincing. In fact, after casually switching between the two charging options (airplane on, and airplane off as usual) over multiple charges, we couldn’t really notice a difference in charge time from various points of a drained battery. If there is an expedited charging speed that is offered through AirPlane Mode, it’s probably fairly minimal, maybe somewhere between 3-10 minutes for an iPhone 5, 5s, or 5c. Admittedly, this isn’t a scientific observation by any means (does anyone want to sit still and watch two iPhones charge side-by-side for 3 hours three different times? Probably not, let us know if you do), but presumably if the claim of charging “twice as fast” was actually true, you would certainly observe a difference almost immediately. Is turning on AirPlane Mode worth a 2% faster charge time over the course of a couple of hours while missing out on texts, phone calls, data, emails, and whatever else you use your phone for? You can decide that on your own. So while we’re not convinced it’ll make much of a difference in how long it takes to charge your iPhone, if you do this regularly and have some data to back it up, let us know your own results. By the way, if you do actually want to charge your iPhone as fast as possible, the best thing you can do is plug it into a wall outlet and not use the phone while it’s charging. Powering the bright backlit display and using heavy data usage does actually use power, so by not using either you can expedite the process a tad. 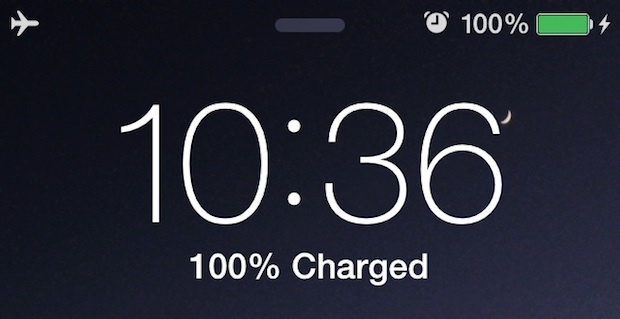 From a 0% charge, the iPhone will usually be back to 100% in around 3 hours or less. Aside from that, it’s usually best to focus on preserving battery by turning off unnecessary background activity, unused location services, and various eye-candy features. It works. Placebo effect. People observe what they want to observe and they want to think something will work. I tried this a week or two ago and couldn’t tell any difference. Turning the screen off, not using HotSpot, not using GPS, that may help charge the iPhone in it’s advertised “2 hour” timeframe. If you’re using the thing actively, it’ll charge slower. Pretty simple. Find an Electrical Engineer to offer their thoughts on this, they’d be able to offer conclusive points one way or another. I’m on call 24/7, as are I’m sure many of your other readers too, so AirPlane mode and Do Not Disturb aren’t options for me. I doubt it helps anyway. If you really want to quick charge an iPhone, plug it into an iPad charger 10w or 12w). Apple states it is perfectly safe. The iPad charger provides more amperage. You can also get a car adapter that can charge an iPad and that will also charge an iPhone fast even while using GPS turn by turn directions. The difference in using the high amp iPad charger is remarkable. You can fully charge an iPhone in about an hour. Yup, this is what works. I’m sorry to have to tell you this, but the charge rate is the same with iPad adapter as it is with the iPhone adapter. I know that you believe that it charges faster with the iPad adapter, but, it really does not. It’s easy to prove: Measure the current flow out of the adapter into the iPhone. Regardless of whether it’s the iPhone adapter or the iPad adapter, it will flow almost exactly 1A — even though both adapters are capable of supplying much more (despite ratings of 1A on the iPhone adapter, independent tests have shown that it can supply up to 1.8A continuously). There are a lot of misconceptions related to iPhone charging and current ratings on the iPhone and iPad power adapters. As an electrical engineer, I’d like to clear up some misconceptions. Apple supplies a power adapter, not a “battery charger,” with the iPhone and iPad. The iPhone power adapter supplies a constant 5V at up to 1A (rated – tested to 1.8A). The iPad power adapter supplies a constant 5V at up to 2 or 2.1A (rated). The iPhone’s battery charging voltage and current are regulated within the phone. The iPhone’s battery is rated at 3.7V. Charged with the raw 5V from the power adapter, it would be destroyed. Fortunately, the internal regulation in the iPhone prevents that. The maximum current that an iPhone will draw from a 5V power adapter is right around 1 amp. It does not matter if the charger is capable of supplying more, that’s the most that the iPhone will use. Because of the internal charge regulation, the iPhone battery will not charge any faster on an iPad power adapter than on an iPhone power adapter. Apple approves the use of the iPad power adapter with the iPhone. It is completely safe for that purpose and does not harm the phone or battery in any way. But it doesn’t charge it any faster. A water analogy might make this much easier for people without electrical engineering backgrounds to understand. * Water pressure (psi) is analogous to voltage. * Water flow (gallons per minute) is equivalent to current flow (amps). * A faucet valve is analogous to the iPhone’s battery charging regulation circuitry. * A bucket’s capacity (gallons) is analogous to the iPhone’s battery capacity (amp-hours or AH). You adjust the faucet to flow 1/10 of a gallon per hour. The five gallon bucket will take 50 minutes to fill up. That’s equivalent to the charge circuitry in the iPhone adjusting the current flow from the adapter to 1A to charge the battery. But then you need a lot more water flow for a new sprinkler system. That’s like needing more current to charge an iPad. Since the water pressure is constant at 80psi, the only way to get more flow use a bigger supply line. Since the voltage from the adapter is constant at 5V, the only way to get more power is to use a higher current power adapter. After installing the new higher capacity water supply line, you go out to your faucet and adjust it to 1/10 of a gallon per hour. After plugging in the higher capacity iPad adapter, you plug in your iPhone and its charging regulation circuitry adjusts the current flow to about an amp. The bucket still takes just as long to fill up. The iPhone battery still takes just as long to charge. The faucet is not under additional strain since the pressure is still 80psi. The iPhone’s battery charging circuitry is not under additional strain since the supply voltage is still 5V. I hope that I’ve clarified this for those who want to better understand the subject. Fred is right. I’ve done considerable testing with different chargers and cables and can confirm that an iPhone will not charge faster with an iPad charger. The iPhone simply uses a max of 1 Amp no matter which charger it is connected to. Cheap cables play a bigger role. If you buy cheap cables, especially long ones, the wiring gauge is too thin and restricts power flow below 1 amp in many cases. Airplane mode makes nearly no difference as the iPhone will pull up to .1 amp more to power phone features than it uses for charging. That should well cover the the negligible powe draw of the radios. The screen is a massive power hog and I can assure you keeping the screen off will affect charging speed. Also, plug in the phone and completely power it down (not just airplane mode) if you truly want maximum charging. Then it’s not using the radios, screen, or processing. I’d only go through the trouble if you’re crunched for time and only have 10 min to get as much juice as you can. I’m not sure how much it’ll help. lastly, max power draw and quick charging only happens below 80% battery capacity. Above 80% the phone gradually decreases charge speed and power cable draw as it moves closer to 100%. So no matter what you do above 80% isn’t going to affect charge speed as it’s using much less than 1 amp. if you really want to charge it fast, simple way to do it through MAC BOOK PRO, I charge it by connecting with USB. Its much faster than power adapter. Trust me, you should try. and yes, i have USB 3.0 in my mac book. While I wouldn’t ever believe 2x faster charger, I do honestly believe that charging with Airplane mode on does charge faster IN MY USE CASE! In my use case, I am charging via a 1 amp cigarette lighter on an iPhone 5S in my car on my way to/from work. If I was NOT in airplane mode, Bluetooth stream of Pandora would be going on, even if I was listening to the radio or a CD. This is because I don’t have remote controls over Bluetooth, so I leave it playing for when I flip to my AUX input so I don’t have to take my hands off the wheel (steering wheel controls). But I’m not fooling myself. Most of the “faster charging” is simply b/c I am “not using” the phone as opposed to “using it less” on the normal drive. Not to mention that until last week, I had “Frequent Locations” turned on, so the occasional GPS query was happening too. Be aware that not all third party car power adapters provide the proper signalling resistors to tell the iPhone that they can supply more than 500mA. Without those resistors, the iPhone will assume the power to be limited to 500mA and limit its draw to that. Thanks for giving us something to think about. I’ve thought about it before, though, and you have touched on the thoughts that run through my head: “How much time would it save?”, “Can I go without communication for the duration?”, and “Is it worth the effort?”. Without providing hard facts, I’m still left holding my argument that it probably doesn’t have enough affect on the time it takes to charge to make it worth the inconvenience. It really doesn’t take much effort to watch two phones during three charge cycles unless you’re really pressed for time. I’ll be happy to do the comparison if you need me to. Where you plug it in makes no difference. The idea stated is that you’re consuming less power so the battery will charge faster. Making sure the screen is off is probably the best way to speed up a charge. But I agree that the difference is probably negligible. Instead of all the conjecture, why doesn’t someone test it? There couldn’t be an easier theory to prove or disprove, really. I’ve tried this several times and found it to be most decidedly true (though not the 2X part). As with any other type of productivity app, this ‘hack’ depends on how you use your phone (what apps you have running), your preference setup, etc. It definitely speeds charge time up. Oh, and using an iPad charger definitely does charge the iPhone faster than the charger that ships with the iPhone. I don’t care what your electrical engineering degree tells you about power, voltage, ohms, etc. All I need is a clock to tell me it does.